The Volcker Alliance evaluated all fifty states' adherence to best practices on a set of nineteen common budget practice indicators, within five budgeting categories: Budget Forecasting, Budget Maneuvers, Legacy Costs, Reserve Funds, and Transparency. 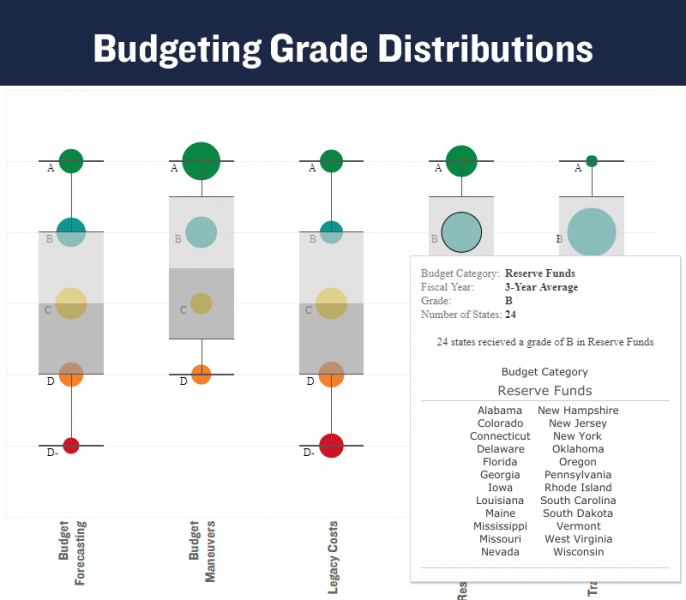 Use the data visualization below to explore whether each state followed or failed to follow best budgeting practices in each of the budgeting practice indicators over the three fiscal years studied, 2016 through 2018. Select one or more of the available filters to compare across states, budgeting categories, budgeting practice indicators, geographic region, fiscal year and more. You can download the data set as an excel file, including all the budgeting practice indicator results for all 50 states for fiscal years 2016-2018, by using the 'Download Data' button at the top right of this page. The Budget Forecasting category was graded on a state’s use of a consensus revenue forecast; having a reasonable rationale for revenue growth projections (based on historical revenue and economic growth trends); producing multiyear revenue forecasts; and generating multiyear expenditure forecasts. 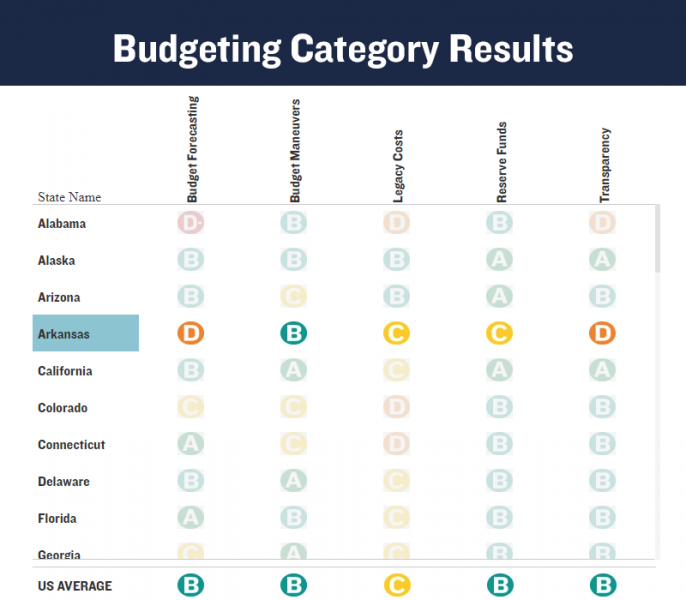 The Budget Maneuvers category was graded on a state’s use of one-time actions to create short-term budget fixes, often to the detriment of long-term budget sustainability. Research questions related to one-time actions were grouped into four types of budget maneuvers, and states received credit for each type they succeeded in avoiding. One-time actions included funding recurring expenses with debt; funding recurring expenses with the proceeds of asset sales or by tapping future revenues; deferring a current year’s recurring expenditures; and covering general fund expenditures with transfers from other funds. The Legacy Costs category was graded on a state’s willingness to meet public employee pension obligations and other postemployment benefit (OPEB ) obligations. Thirty percent of a grade was determined by a state’s actuarially required or determined contribution (ARC or ADC ) for OPEB . Thirty-five percent of the category grade was based on whether the state made its public employee pension ARC or ADC , and 35 percent was based on the state’s pension funding ratio, which represents the amount of assets available to cover promised benefits. While it is best for states to make the full payment that actuaries determine is necessary every year, missing such a contribution is of greatest concern to states with high unfunded liabilities. The Reserve Funds category was graded on a state having a reserve fund disbursement policy; having a reserve fund replenishment policy; tying reserves to historic trends in revenue volatility; and having a positive reserve or general fund balance at the beginning of each fiscal year. The Transparency category was graded on the extensiveness and usefulness of a state’s financial disclosure practices. 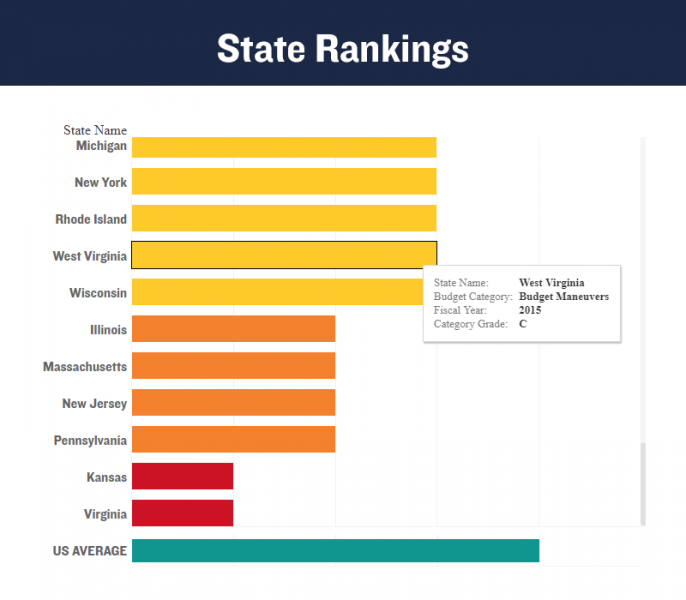 States received credit for having a consolidated budget website; disclosing outstanding debt and debt service cost tables; providing information on deferred infrastructure maintenance costs; and providing cost estimates for tax expenditures.